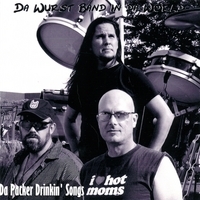 11 different versions of the tailgate party hit, "Da Packer Drinkin' Song" that was featured each week on "Wisconsin's Rock Statoin" WAPL 105.7 FM in Green Bay. Da Packer Drinkin' Songs CD contains 11 different versions of the hit tailgate party song, "Da Packer Drinkin' Song"! The song was re-recorded weekly for "Wisconsin's Rock Station" WAPL radio 105.7 FM in Green Bay, WI during the 2007 Green Bay Packers season. "Da Packer Drinkin' Song" is the #1 Packer song featured on MySpace pages around the world! Now, let's get this tailgate party started!